What is Dasuquin® with MSM? 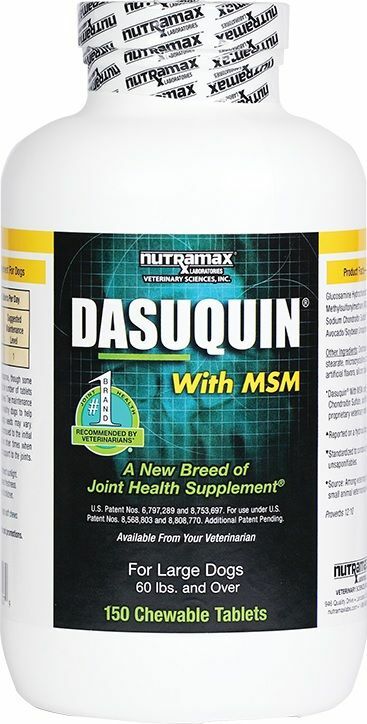 Dasuquin® is a joint supplement for dogs. Dasuquin® combines ASU (avocado/soybean unsaponifiables)(90mg) and decaffeinated tea with glucosamine hydrochloride(900mg), low molecular weight chondroitin sulfate(350mg) and MSM(800mg). This unique combination makes it the most comprehensive health management formula available. Who is Dasuquin® with MSM for? Large Dogs (over 60 lbs). Can be given as treat. Your dog will love the taste and and take it readily. How much Dasuquin® will I receive? Each Bottle contains 150ct. This size is the most is the most economical for long-term use.